Gnome Press, 50% down and 50% to go!! The first 25% took 6 months. This, the second 25%, has taken a little over a year. While the process of procuring the previous acquisitions was always exciting, this time around has, while also exciting, certainly had a few more ups and downs. Chief among the ‘downs’ was my almost 6 month lull in reading and consequent lowered contributions to this blog. From February to June I only got up only 8 posts, with none in May. I abandoned reading Judgment Night as I fell so out of touch with the book that I felt it would be better to revisit it later. I haven’t posted Review since Mutant on December 29th!! I should have another up in the next couple of weeks though. That aside, things are pretty much back on track now, and the ‘ups’ have been a few too. The biggest has been the most recent – Science Fiction Terror Tales. I also picked up a nice copy of Pattern for Conquest which was a very desirable title to me, and SF:56 was a real highlight (see below). So let’s see how the state of play has been in the Great Gnome Press Science Fiction Odyssey through the second quarter. Science Fiction Terror Tales edited by Groff Conklin – $267, and my most expensive acquisition thus far. SF’58: The Year’s Greatest Science Fiction and Fantasy edited by Judith Merril – $8, real bargain this. $47 – 10 dollars less than the first 25%, good news!! SF: The Year’s Best Science Fiction and Fantasy (SF:56) edited by Judith Merril. I bought it unseen and on recommendation for the apparent high price of $93. At a print run of only 3000 copies, it is one of the least common Gnome Press titles, and possibly in the best condition of any I have. After being a bit anxious about what I had bought, it turned out to be a real find. Hands down number one: getting hold of Science Fiction Terror Tales. Discovering Ms. C.L. Moore as a writer. 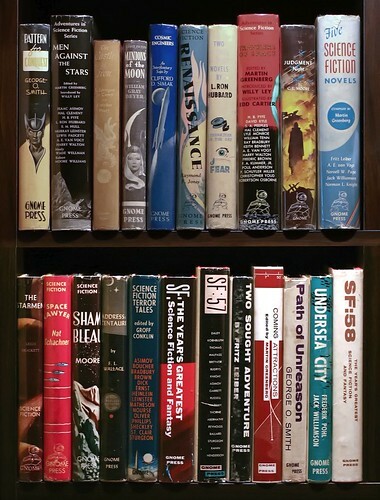 Completing the set of the fantastic Adventures in Science Fiction Series of anthologies. Still two to read. It’s worth noting that there are still two titles from the first 25% that I haven’t yet read – Sands of Mars and The Vortex Blaster. This entry was posted on August 29, 2010 at 2:54 am and is filed under 50%, Progress Report with tags Gnome Press. You can follow any responses to this entry through the RSS 2.0 feed. You can leave a response, or trackback from your own site. I tried to read the Cosmic Engineers recently and quit about half-way through. It was just too primative. What will you collect after you have bought all the Gnome titles? Yes, it wasn’t a fun thing to endure. A bit embarrassing to read actually. After I’ve bought them all?? I think I’ll die of old age James. 🙂 It might be a while before reasonable copies of books like Foundation and I, Robot make it on to the shelf. In all seriousness I would like to complete my collection of signed first editions from Gene Wolfe, and there are several other first editions that I want on my shelf too. Dune, The Puppet Masters, Atlas Shrugged and Titus Groan to name a few. Stories that mean something to me personally for various reasons. However, gotta have something to aim for, right?? Hey Aaron, you know that there are 4 PB digest Gnome Press books (including an I, Robot) that came out for the armed forces guys for the Korean War, right? Thanks Chris, yes I do. I have one of them – George O. Smith’s Pattern for Conquest. There’s a bit more info about them in this site here and here.